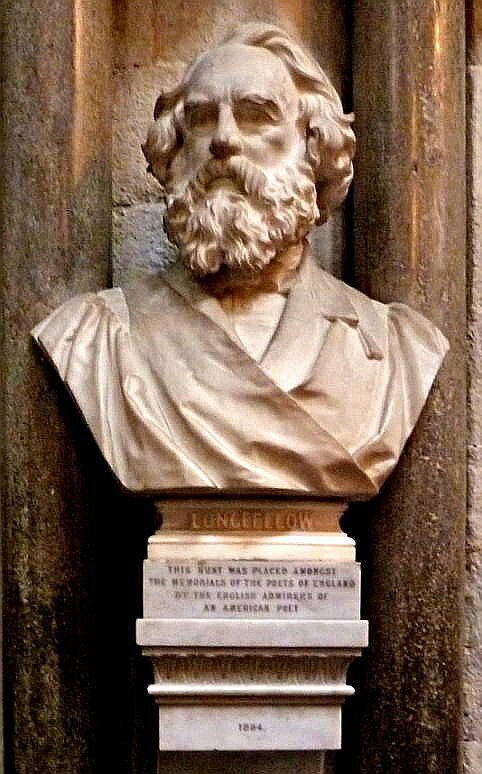 The inscription reads, "This bust was placed amongst the memorials of the poets of England by the English admirers of an American poet." It testifies to Longfellow's " substantial reputation among the British public" (Calhoun 250), something confirmed on his visits here, particularly that of 1868, when he was awarded an honorary doctorate of Laws at Cambridge, breakfasted with Gladstone, and was received by Queen Victoria and the Prince of Wales — though the Queen herself was not very complimentary, telling him that he was popular with the servants! (see Gale 278). Photograph and text by Jacqueline Banerjee, 2011. Calhoun, Charles C. Longfellow: A Rediscovered Life. Boston: Beacon, 2004. Gale, Robert L. A Henry Wadsworth Longfellow Companion. Westport, CT: Greenwood, 2003.